This is a great home for 2-3 families with children, or small groups of 10-12 adults max. You’ll immediately shift into beach vacation mode when you step inside Seahouse Escape. The new beach-inspired colors, furniture and décor, as well as the comfortable, open rooms invite you relax and enjoy seaside living. And the pristine white beach is only about a block away! We also offer a COMPLIMENTARY 4-passenger GOLF CART to make beach access even easier. We keep our home clean and well-updated, and pay attention to amenities you'll need, such as high-speed internet (free wifi), nice flat-screen TVs, high-definition cable, hair dryers in each bathroom and more. We also provide items our smaller guests may need like a high chair and pack-n-play. You’ll love the spacious, open floor plan of the main house with tile floors, plenty of comfortable seating in the living area and a large flat screen TV with DVR/Blu Ray. The dining table seats 8, with additional seating for 4 at the breakfast bar. You’ll enjoy cooking in the bright, open kitchen with plenty of counter space and new Stainless Steel appliances. You’ll find all the dishes, pans and utensils you may need, a Keurig D-Cup coffee maker, crock pot and even a few spices, to get you started. We want you to feel at home, and the large, open layout is a perfect gathering spot for your family or friends. Down the wide hallway from the Master Bedroom, this super-size bunk room features 2 sets of TWIN-over-FULL bunks and a QUEEN BED (5 beds total in this room! ), so there’s room for up to 8 children, or 6 adults. Everyone will love having this space to hang out when they’re not outside enjoying the Destin sunshine. There's anew SMART TV for indoor fun. The bunk room also has its own private full bath. We know how difficult it is to find a vacation rental to suit your family’s needs, schedules and budget. We’re happy to assist you with the process of finding and booking the right place to stay for your vacation. We don’t leave you hanging—we actually answer our phone and do our best to get back to all email inquiries within an hour (and if you put your phone number into the inquiry form, we will call you)! We always keep our calendar up-to-date. If this property is booked, be sure to check our other properties we have by pressing the “All My Rental Listings” link above the Photos section of this page. We have been part of VRBO since its early days, being long time friends and colleagues of the founder. We understand the 'by owner' nature of this business better than anyone, and go above and beyond to bring you a great home. We own these homes and are truly offering them 'by owner.' We are local and will meet you here, so we have to be proud of them. We also provide honest rates, and don't charge reservation or other junk fees. We keep our calendars up-to-date and typically reply to inquiries within minutes. Destin is one of the most popular vacation spots on VRBO for a reason - family oriented, amazing beaches, lots of attractions, shopping, and great seafood and fishing. We think the Crystal Beach community is hands-down the best Destin has to offer for families. It's quaint and quiet with cottage-style homes and white picket fences, sidewalks, nestled right on the beach, and lower density - no high-rise condos allowed. Crystal Beach is surrounded by Destin Commons and other multitudes of shopping, restaurants, and entertainment for the entire family. 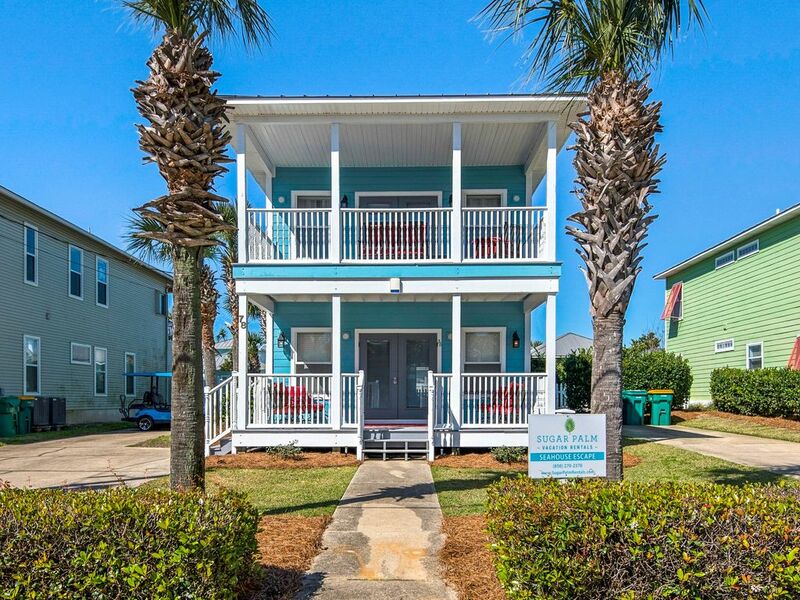 We love our house because it is only steps from the beach, always kept clean, and is roomy and comfortable with new renovations and all new furniture in 2012. The private pool is relaxing, and a separate carriage house provides privacy for our friends and in-laws when they come down with us. We love the Crystal Beach community because we like to walk. Lower density, sidewalks, picket fences, and ocean views make walking a real treat in Crystal Beach. 3 separate central systems, one for each floor in main house, one for carriage house. Many excellent courses in Destin, only minutes from the house. Very nice private pool in back yard, can be heated in cooler months for an additional fee.